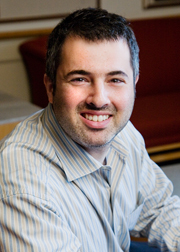 Darren Lubotsky is an Associate Professor at the University of Illinois at Urbana-Champaign. He has been at the University of Illinois since 2002 and currently holds appointments in the Department of Economics, Institute of Government and Public Affairs, and School of Labor and Employment Relations. From 2000 to 2002 he was a Postdoctoral Research Associate at Princeton University. He received his Ph.D. in Economics from the University of California at Berkeley in 2000. Most of his research falls within two broad areas: immigration to the United States and the health and cognitive development of children, both of which are at the heart of many current policy discussions. Recent immigration work examines the economic progress of immigrants to the United States, including the effects of growing wage inequality on the relative earnings of immigrants and the effect of selective outmigration on the measured progress of immigrants who remain in the country. Darren Lubotsky joined CReAM as an external fellow in March 2009.